Soy is one of the oldest foods in the world and it has its origin from East Asia. There are many beliefs towards this single dish, but as more research is done about it, controversies that are at the same time annoying spring up. Soy has been for a long time credited for its nutritional benefits, but the latest studies have drawn an insight into the negative part of this particular food. Soya Paneer, in this case, is a common food in India and it is also termed as Tofu or bean curd. It is commonly referred to as a vegetarian meat due to the high proteins in it. There is no big difference between it and soy just that paneer is added to it to make soya paneer. Whether it is infertility in men or women, intake of soya has to be watched closely. For a man or woman desiring to have children, foods and drinks that contain soya however nutritious they may be have to be taken in fewer amounts. The question as to whether soya paneer leads to male infertility or not has no exact answers, but according to a study conducted on different men showed that those who highly consumed soya and its products twice a week and multiple times within a month had issues with their sperms. There were lower sperm concentration and a decrease in sperm production in them. Therefore, men of any body weight are at a major risk when they persistently consume soya paneer. 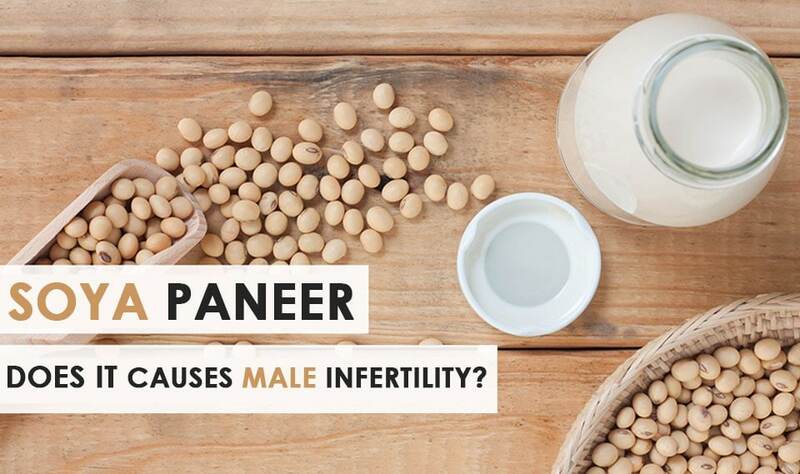 There is no doubt that soya paneer is good for health in both men and women, but for any man or woman with infertility issues or fighting infertility soya should be off the list or taken in the lowest quantity as possible. Soya is believed to contain an element that impersonates oestrogen a hormone present in females. This hormone is present in males, but in a lower level. When a man increases soya intake, the hormone is increased, hence leading to male infertility. Studies are still being conducted to verify and gather more information revolving around soya, Tofu, and male infertility. Controversies around soy can’t be ignored because the fact is, when a man is faced with a low concentration of sperms or low sperm count the end result is infertility if the situation is not corrected in time. In addition, smoking, use of illegal drugs, and over-consumption of alcohol can increase male infertility. Environmental factors mustn’t be ignored if male infertility is to be effectively eradicated. Sumita Sofat is the India’s best gynecologist that runs his own clinic Sofat infertility Centre and provides you the best solution for male and female infertility problems. She loves to write about men and women health issues like IVF procedure, PCOS treatment, IUI Treatment, Azoospermia problem and many others.